The Kohlbacher lab was established in the year 2000 and currently consists of three different groups at Universität Tübingen (Applied Bioinformatics), the Max Planck Institute for Developmental Biology (Biomolecular Interactions), and the University Hospital Tübingen (Translational Bioinformatics) working in different areas of bioinformatics and medical informatics. The Chair for Applied Bioinformatics at Universität Tübingen focuses on research in the analysis of omics data (genomics, proteomics, metabolomics), structural bioinformatics, and computational immunomics. We are workinge closely with experimental labs and develop and apply novel methods and algorithms to solve problems in the life sciences. We have a long history of providing high-quality research software. The biomolecular interactions group at the Max Planck Institute for Developmental Biology, where Oliver Kohlbacher holds the position of a Max Planck Fellow, studies interactions between biomolecules (DNA, RNA, proteins) using high-throughput methods and develops novel computational approaches to reconstruct structures of molecular complexes from sparse data (e.g., cross-linking mass spectrometry or evolutionary couplings). 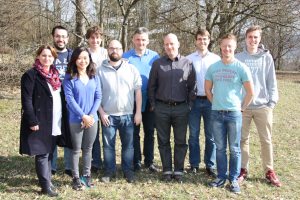 The Institute for Translational Bioinformatics at the University Hospital Tübingen is working at the interface between medical informatics and bioinformatics. As part of the DIFUTURE consortiums, we are working on the development and establishment of Data Integration Centers as part of the German Medical Informatics Initiative.